What makes up the Universe? Particle Physics! Hello curious viewer! I was skimming around Zooniverse (which is a web-based citizen science organization) one day and came across a project containing particle physics. I’ve always been interested in physics, so exploring this project was a simple yes for me. It’s run by Higgs Hunters, a group of scientists and organizations who research particle physics. We’ll get more into Higgs Hunters in further posts. But for now, what is particle physics? Particle physics is the study of the basic elements of matter and the forces acting on them. It also aims to determine the laws that control what makes up the universe and matter, such as gravity and energy. The research of particle physics utilizes various pieces of technology. The technology utilized is called a particle accelerator. The most famous of the accelerators is called the LHC (Large Hadron Collider). A question now arises: How do these accelerators work? The most basic process is that these accelerators accelerate beams of charged particles into areas of the accelerator called particle detectors. Often two beams are set up to collide with each other or sometimes with stationary objects. This collision produces light. One of the detector’s jobs is to locate any new particles found within the light or from remnants of the collision. The collision is driven by what is called electromagnets. These magnets steer and focus the particles to their collision point. When particles are first accelerated, they tend to move in all directions. A quick physics lesson on why the particles stay compressed in the accelerator is that magnets have opposite ends ( North & South) that provide forces on the particles that keep them compressed. Below is a diagram of how the magnets in the collider work. 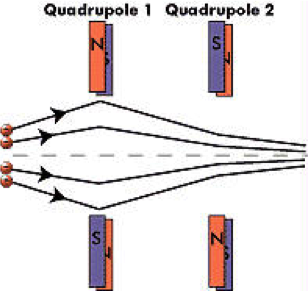 The lines in the diagram represent the lines of particle’s motion.The poles are producing a squeezing force, balancing the beam of particles to be the middle. Now that we know how colliders work, let’s quickly overview a famous detector called ATLAS. Atlas is one of four detectors in the LHC and is responsible for studying the precise details of new particles left over from a collision. Atlas looks into the light from a previous collision to start its research. Recently, a new particle has been found called the Higgs Boson. This is what ATLAS is currently studying. Fun Fact: Smashing particles excessively can recreate the conditions that were present in less than one billionth of a second after the Big Bang. In conclusion, particle physics is a very complex subject and produces masses of data. With that said, you can be involved. How? Well, look out for the next post to find out! Galaxy Zoo started in 2007, and since then, astronomers have posted millions of images taken by Sloan Digital Sky Survey. Visitors look at images of galaxies and give simple responses about the shape of those galaxies. Don’t worry if you don’t have any ideas about the shapes of galaxies. This site offers you a tutorial so that you can easily follow along with the questions that are being asked. In the past, the task was slightly simpler than it is today, but now they can capture images with higher resolution, which means the images on the site have more details. Surprisingly, Galaxy Zoo does a lot better than the 1000 images one person could do daily. In fact, the site got 70,000 classifications within 24 hours after this site launched. Let’s take a look to site’s statistics. 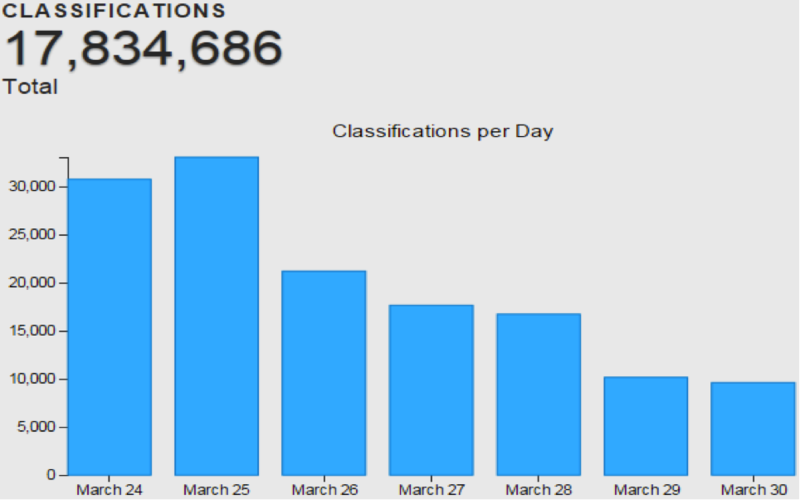 In the bar graph above, it shows daily total classifications in the fourth week of March 2015. We can see that on March 24th and 25th, there were more than 30,000 classifications done daily, but as the week goes on the number decrease to just 10,000 classifications, so on average approximately 20,000 classifications done by users daily. Peak classifications, like those on March 24th and 25th, are usually because a new blog post has just been posted, which is usually published in the beginning of the week. You can see that it is about 20 times faster! That is why, astronomers need YOU! Those facts already prove to you that being involved in citizen science is fantastic. As this project isn’t only popular, but also educational. So what are you waiting for? Click this link to get started and explore Galaxy Zoo! 92,955,807 miles above Earth, the Kepler Space Telescope orbits our planet and observes light from close to 150,000 stars. Astronomers turn data from Kepler into graphs of light given off by celestial bodies over time. These graphs are called light curves. For a better understanding of light curves, give the NASA graph (left) a glance. Position one shows a planet before it passes the star it orbits. In this position, Kepler observes the star’s normal brightness. In position two, the planet stars to pass between Kepler and the star. As a result, Kepler perceives less of the star’s light. 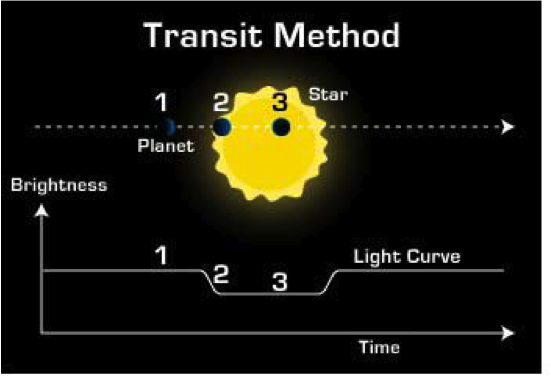 In position three, the planet blocks as much of the star’s light as it can, and the lightcurve dips even further. Scientists work backwards from the low points they see on these graphs in order to identify exoplanets. Exoplanets are planets outside our solar system. They either orbit other stars or travel the universe without a host star. So far, we’ve only confirmed 1,827 exoplanets, but astronomers have thousands more candidates to consider. Zooniverse — a portal to citizen science projects ranging from physics to humanities — hosts Planet Hunters, which allows users to help find exoplanets through lightcurve analysis. But why do we care about finding these planets? If nothing else, it’s cool. From dreaming up constellations to watching “Star Trek,” humanity has demonstrated its stargazing curiosity countless ways. Now we’re finally able to explore — at least from a distance — the worlds we’ve so long dreamed of. That’s my first, unabashedly geeky answer. But of course, not everyone is so easily fascinated by these planets. Beyond wow factor, exoplanets are key to our understanding of how our Earth and solar system function. The eight planets that orbit the Sun make up a small datapool. As a result, there’s knowledge we have to look beyond our solar system to gather. Exoplanets are often at different stages in their life cycles than Earth, and the solar systems they make up have different characteristics than our own. This diversity has taught us how our solar system could have looked. Some stars host larger planets, some have their planets distributed differently, and yet others have planets with more distinctly elliptical orbits. This diversity also teaches us about solar system formation. For example, solar systems with Jupiter-sized (big) exoplanets near host stars confirmed the theory that planets move during formation. And, of course, exoplanets propel us towards answering what many consider the ultimate question: are we alone in the universe? We don’t yet have the technology to search for exoplanetary life, but that that doesn’t mean that life isn’t out there. As we start to measure which planets are habitable (since we don’t have a better way to define “habitable,” I just mean Earth-like) our search will narrow, and we might even be able to answer that ever-looming question.